Entomophagy, the practice of consuming insects as food, is starting to enter the realm of "normal" in the US, and it all begins with a flour made of crickets. 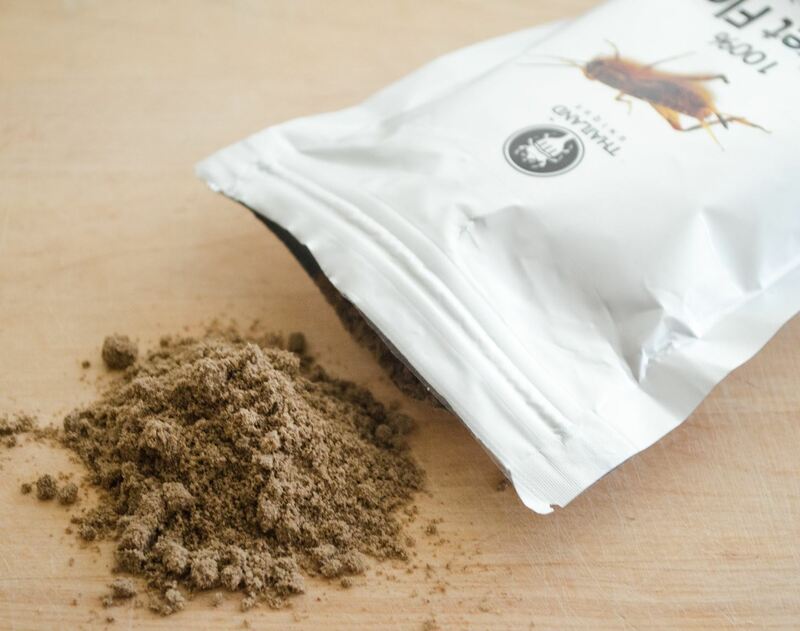 Cricket flour, also known as cricket protein powder, is made from 100% ground crickets. To make this flour, the crickets are dry-roasted in an oven and then milled. The texture of cricket flour is similar to sand; it's grainy, but soft like flour. It's dark-colored, about the same shade as dark brown sugar. Cricket flour smells distinctly nutty, but also a little fishy. I see no antennas or legs poking out. If I showed this to someone else right now, they would never guess it were made of crickets. 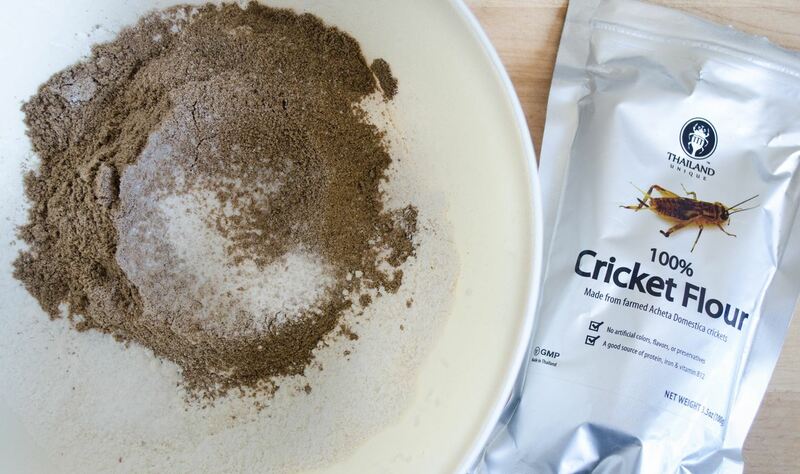 Crickets are closely related to shrimp and contain some of the same allergenic compounds, so be aware of this when eating/using cricket flour. Crickets require six times less feed than cattle do as well as taking up less land and omitting less greenhouse gasses. Also, a report by the Food and Agriculture Organization of the United Nations states that crickets and other insects are full of protein and nutrients. Cricket flour, in particular, has 15% more iron than spinach, and two times more protein than beef, according to manufacturer claims, so what's not to love? Taste testers for Consumer Reports tried out protein bars made with cricket flour as well as cookies and detected no hint of insects or even an unusual flavor. Of course, we can't base everything we know about the flavor of cricket flour solely off of a sampling of commercial snacks, so I made a batch of my favorite chocolate chip cookies from Food52 to see how cricket flour affects this popular, everyday treat. 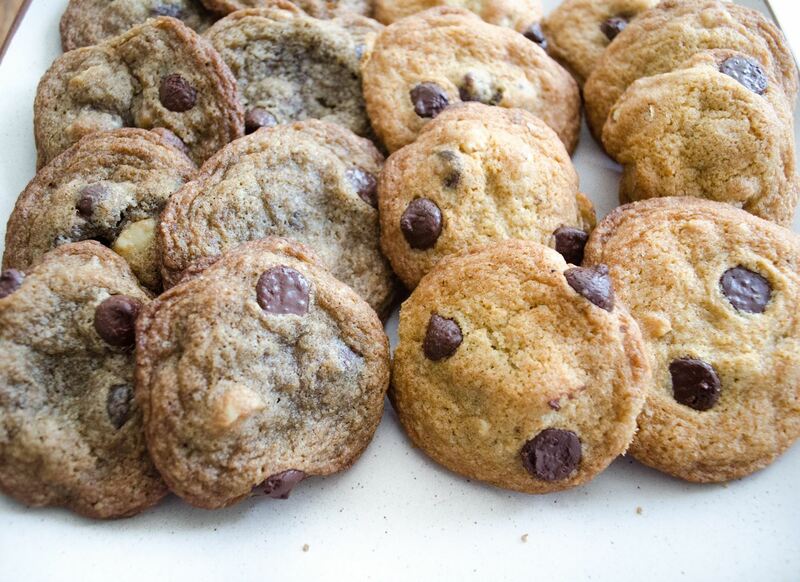 In this experiment, I made two batches of chocolate chip cookies. The control batch was made exactly how the recipe is written, and the cricket batch was made by swapping some of the all-purpose flour out for cricket flour. Both doughs used all the same other ingredients and were mixed for exactly the same amount of time. When baking with cricket flour, you can't just substitute cricket flour for all-purpose flour. 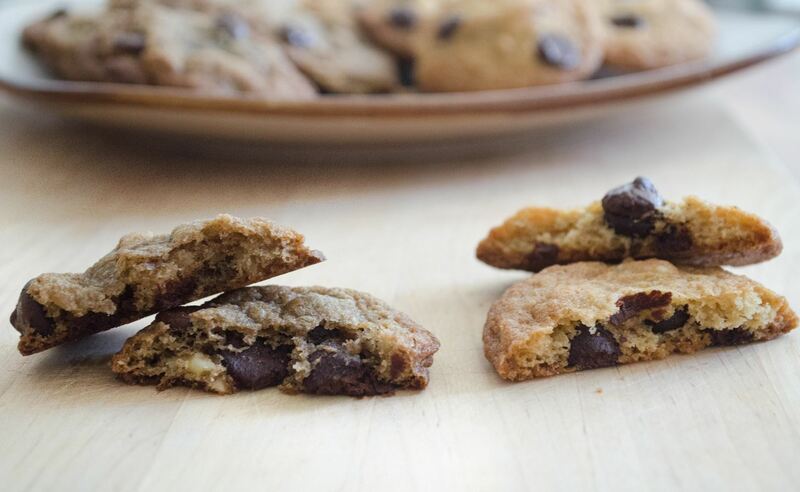 Cookies gain structure from gluten, and crickets don't have any gluten. In making these cookies, I subbed 1/3 of the required flour for cricket flour and left 2/3 of the flour as all-purpose. I don't recommend using any more cricket flour than this, or you will start to see a negative effect in the texture of the cookie. As expected, the control batch dough came out looking and feeling like, well, cookie dough. It was light and fluffy, yet firm. The cricket flour test batch dough was also light and fluffy but was softer. This is a sign that it was lacking some structure because some of the gluten was removed with the flour. 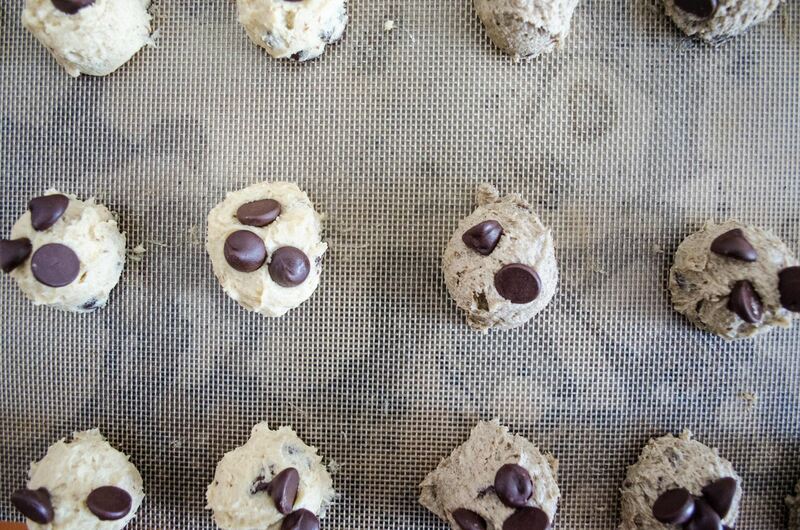 Since the cricket dough was softer, it was easier to scoop than the normal cookie dough. 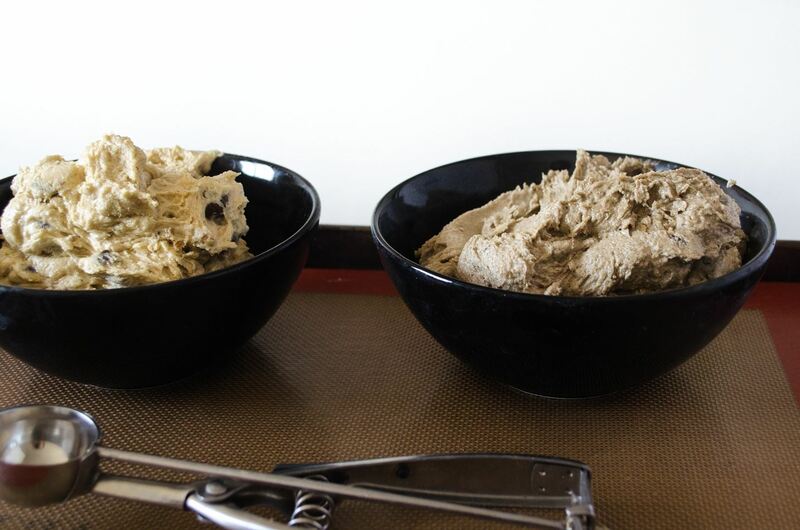 I would compare the difference in texture of the doughs to scooping ice cream. The control batch felt like I was scooping frozen-solid ice cream, in comparison to the cricket dough that felt like softened, slightly melty ice cream. The cookies were all baked at 350°F for 10 minutes. There was a little more spread to the cricket flour cookies than with the control cookies. This is almost certainly due to the missing amount of AP flour (and therefore, structure) in the cricket cookies. Besides the small amount of apparent spread, the cricket cookies did not bake much differently than the control cookies (minus the darkened color, likely caused by the browner cricket flour). When looking at the two cookies side by side, it's obvious that something's up with the darker colored cookies. Had I blind-tasted them, I probably would have guessed that there was a healthy ingredient in them, but I would have never guessed that they were made with crickets. Color: The cricket flour cookies were a dark, palish brown, while the control cookies were golden. Texture: The cricket cookies were crispier. The interior was chewy, but they were missing the somewhat "cakey" texture that the control cookies had. Taste: The cricket cookies were definitely earthy, but not in a bad way. They were nutty and malty, which are positive dessert traits in my book. The chocolate really tied the flavors together and made me feel like I was eating a gooey chocolate chip cookie from my childhood. So I would say that the cricket flour cookies were a successful way to pack protein into a delicious treat! If you are thinking about trying cricket flour, please purchase it from a reputable source. It isn't safe to catch and roast crickets from your own backyard. 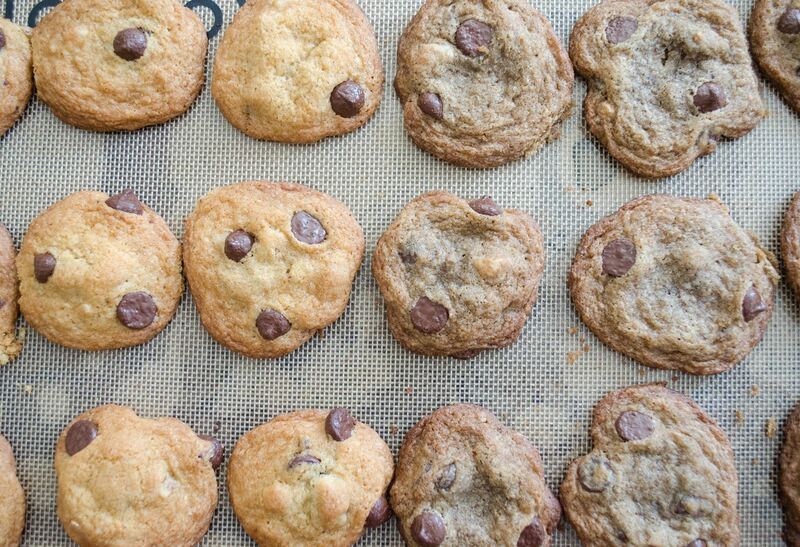 Once you have cricket flour, use it to replace no more than 1/3 of the amount of flour in your favorite batch of chocolate chip cookies or any other cool cricket flour treats. Then, jump for joy (in spirit of the crickets)!